The global leader in end-of-arm tooling for collaborative robot applications releases the Digital I/O Converter Kit for seamless integration with popular robot brands. 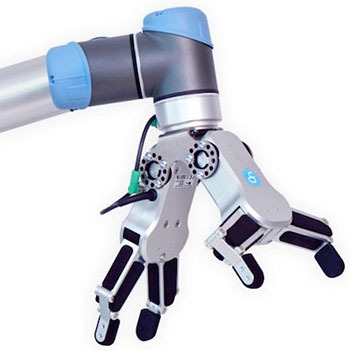 At the Automate 2019 show, OnRobot will showcase products on eight different robotic arms. Integrating grippers with robot arms is often one of the biggest headaches when developing new robotic applications. A major obstacle is mismatched I/O signals between the end-of-arm-tooling (EOAT) and the robot arm. To address this challenge, OnRobot is launching the new Digital I/O Converter Kit to support seamless integration of its RG2, RG6, Gecko, and VG10 grippers with a wider range of both collaborative robots (cobots) and traditional robotic arms. A small converter device, the Digital I/O Converter now facilitates out-of-box integration with KUKA, FANUC, Yaskawa, Kawasaki, Doosan, Nachi, and Techman robot arms. As different robot arms understand I/O signals differently, the Digital I/O Converter Kit works by converting NPN to PNP signals, and vice versa, which means programmers don’t have to worry about the robots and grippers not understanding the signals received. The Converter Kit also includes an adapter plate to convert the OnRobot standard mounting flange to match the robot’s flange.